These African masks have been painted and has taken inspiration from the various African regions. The artists use a labor intensive technique of painting to enhance the masks. The mask has been painted using hundreds of small dots using acrylic medium of paint colors. The colors involved in such type of painting techniques are usually bright to provide a traditional and exotic appearance to the masks. These masks symbolize the authentic African tradition and heritage representing mythological creatures, demons, tribes and deities. This mask can help preserve the rare African culture and practices intact. This African mask wall hanging is available in white color preserving within it the folklore tradition. This mask wall hanging is perfect for decoration as well as a gifting option since it is believed to be a symbol of good luck, prosperity and fortune. It can be displayed in the living area or bedroom. It can also be a perfect gift for your colleagues and family friends during marriages and house warming ceremonies due to its sensational appearance. 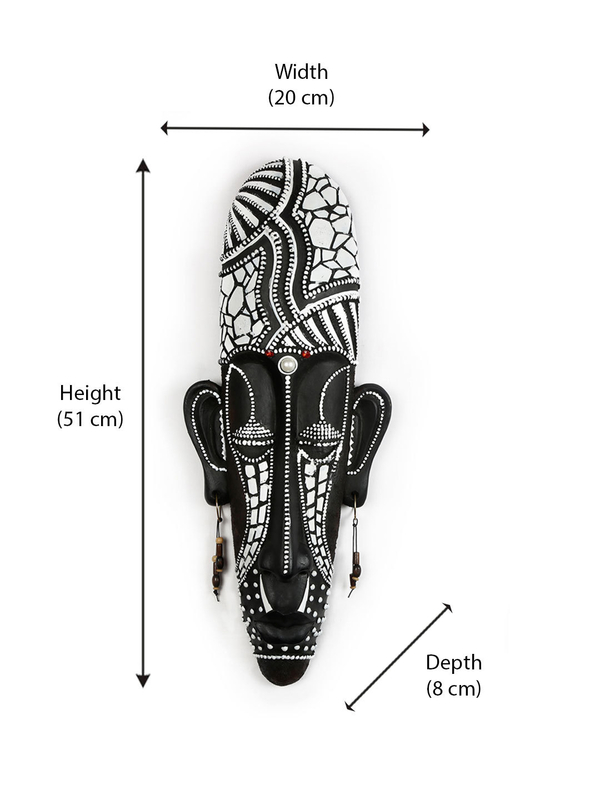 Decorate your walls with this valuable African mask wall hanging. Buy this masterpiece from @Home.